Lipstick & Lollies is a pro at mixing patterns! See how she pairs polka dots and paisley for a polished, causal look! Urban Frill Looks so chic in black, gold and lace! You must check out her amazing tassel necklace! Wardrobes I Met and Liked goes denim on denim but in a fun, unexpected way! The polka dot skinny jeans are to die for!! Ah they're all so lovely! That outfit that was featured was one of my favorites on you! Have a great weekend, Giovanna! Thanks for commenting on my blog! I just looked through yours-- too cute! Count me as your newest follower! I love how you do this. I seriously bought one of the skirts from last week's post. I love the all-white look that she chose! I've tried doing this combo a couple of times and it hasn't quite worked out for me yet. I just need to find the right top! great outfits!!! have a nice weekend!!! You have such great ideas on your blog! ps. Thanks, Giovanna, for your comment on my blog! Still loving that white outfit! I'd love it if you check out mine out and tell me what you think!! This is amazing! Looks like lots of amazing blogs that I need to check out! You have create a great list. I’m going to see some of these. Such a great idea! I love this kind of lists . what a stylish group of ladies! Congrats!!! how fun! YOu look super! This is such a great post. I love it!!! What beauties!!!! Fun post! Thanks for your visit hun! I ask u if vote MY FREE CHOICE here https://www.facebook.com/Sarenza.it/app_388904767806969 ..is very important for me and u can win a shoes! 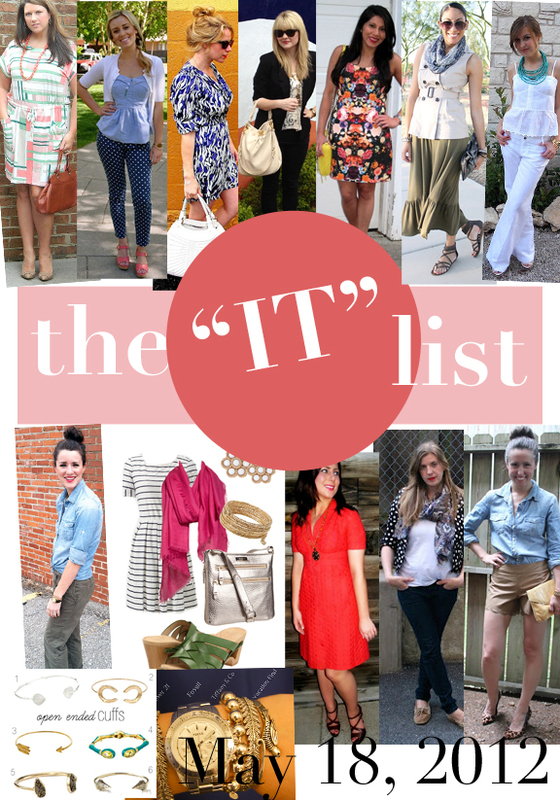 "the It list" is delicious! I have some peeps to check out! Awesome post! I need to check these girls out- great styles! What a great feature! Everyone looks fantastic and ready for summer! Love all the outfit,thanks for the post,see you again.